The A Frame Drill is a staple of Flexbone and Option based offenses. This drill gives the Quarterback and Fullback the necessary reps practicing the mesh while giving the Center a defender to block all in a 10 minutes window. 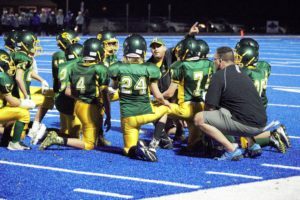 The drill is set up with a Quarterback, Fullback and Center on a line with a player assuming the role of a defensive lineman and a person acting as the read key. It works best if there are two Quarterbacks and 4 Fullbacks (which you will need during the course of the season if you will be running the Flexbone). The A Frame gets it’s name because of the paths that are drawn onto the field for the Midline, Inside Veer and Outside Veer. These paths ensure the Fullback is running the correct line on each play. While they are necessary at the start of the year, by about the second or third week the backs know their path. The drill is a rapid fire drill and is designed to get the players over 48 reps in 10 minutes. The Quarterback will get under the center and take the snap and execute his footwork for the play with the Fullback. 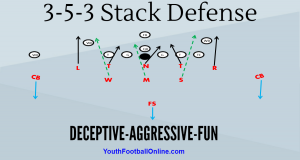 The Read Key and defensive lineman should try to simulate what they are expecting the defense to show. The Quarterback will make the read and the next Quarterback will quickly step in and run the next rep with the third string FB. On the third rep the first Quarterback will be back up and run the rep with the 2nd string FB. The drill will finish with the 2nd string QB running the play with the 4th string FB. One of the keys to getting to all 48 is not having the players loop around. Once you have done the reps going one way the Center and QB will switch side while the Read Key remains in the same place. This lets the FBs step directly into the drill and not have to worry about looping around. While this may seem trivial it saves several seconds in lining up and jogging back into line which adds up over the course of the drill. 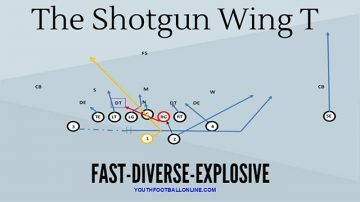 This drill can be set up for any option play. The basic script is to do Midline to the right then to the left on the way back. Next would be Inside Veer to the right and then left. The third option can vary based on your offense but normally we would do Outside Veer and finish with Inside Veer from the Gun. For the Options that included a Pitch man the Quarterback who wasn’t going would serve as a stationary pitch target so he could catch the pitch and step into the next rep. While a moving pitch target would be more beneficial we always felt like A Frame was designed to work the QB-FB Option and we could work the Pitch portion of the option easier in other parts of practice. The key to this drill is to have the players mentally focused and efficient so you can get the maximum number of reps in a short time.